-- Unmask the world of Scooby-Doo with the official character encyclopedia! This illustrated encyclopedia features in-depth profiles, stats, and history of Scooby-Doo and the Mystery Inc. Gang. 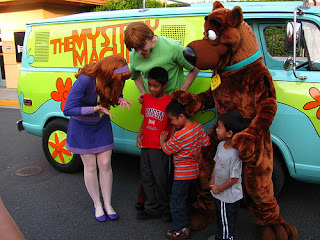 From detailed diagrams of the Mystery Machine to laugh-out-loud jokes to profiles of - ZOINKS! - more than 200 monsters and villains, THE SCOOBY-DOO ENCYCLOPEDIA is sure to please Scooby fans of all ages, from meddling kids to adults. • Scooby Doo Trap Time Deluxe Mystery Machine -- Shaggy and Scooby have plenty of room to ride around in the cab of the Mystery Machine. Included are the Trap Time Mystery Machine with Monster Cage and Net Cannon. • Scooby Doo Monster Set Action Figure -- Scooby, Shaggy, Fred, Daphne and Velma. Plus 5 monsters included. • TY Classic Scooby Doo -- Official product from Ty's wildly popular Collection. Look for the familiar heart-shaped tag that means you’ve purchased an authentic Ty product. - Set your intention this morning to have a positive day! Remember you choose your attitude! A few happy words can make all the difference. Positive thinkers really are individuals who recognize both the bright side and the negative, but they choose to focus their energy and time on the side that's going to promote the most positive outcome, says positivity expert Joffrey Suprina, Ph.D., dean of the College of Behavioral Sciences at Argosy University. -- Give a child gifts to last a lifetime - self-esteem, tolerance, values, and inner strength. This book is filled with inspirational stories for children and their families to share, all about kids making good choices and doing the right thing. The values children learn today will stay with them for the rest of their lives. This collection gives kids positive role models to follow in its 101 stories about doing the right thing and making healthy choices. You and your child will enjoy discussing the stories, making it a family event. Great for teachers to share with students too. • Motivational Wall Decal -- Norman Vincent Pale said: Change your thoughts and you can change the world. What a beautiful quote to put on the walls of your home. Easy to apply to your wall, detailed instructions included. • Chakra Bracelet for Positive Thinking | Communication -- This meaningful Throat Chakra Bracelet features natural Sodalite and Crystal Quartz gemstones to keep your body, mind, and spirit peaceful and balanced in your everyday life with the added personal touch of Reiki Energy. • Positive Thinking Inspired Jewelry -- When you see a dandelion do you see a weed...? Or a wish? This glass pendant necklace includes a zinc alloy bronze-colored flower charm and a clear-colored glass bead. It's a sweet piece of inspirational jewelry designed by Gutsy Goodness.